It is well-known in medical circles that blood sugar levels affect our energy, our muscles. Even those of us who are not diabetic have had that “low sugar” feeling. Unfortunately for diabetics it is even worse. 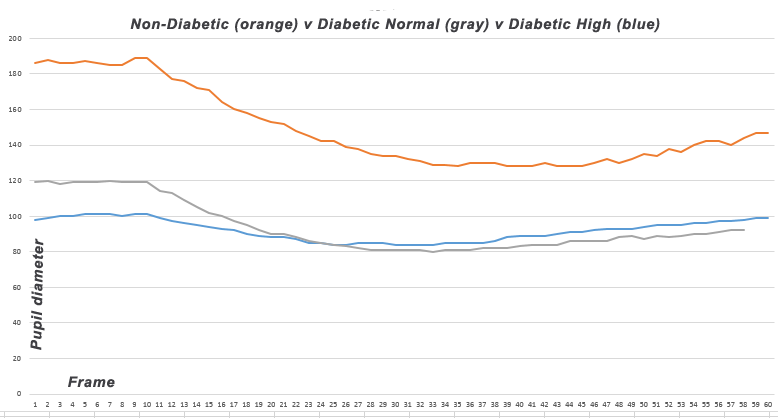 What feels “low” to someone without diabetes, feels “lethargic” to someone with diabetes. Fat and sugar are the fuels muscles use as energy. When sugar (glucose) is out of balance muscles under-perform or act in erratic ways. The pupil of the human eye consists of two sets of muscles, both of which are responsible for pupillary response. GlucoSight takes advantage of a singular hypothesis, that the pupillary muscles would be an early and reliable indicator of glucose levels in the body. GlucoSight measures the diameter of the pupil before, during, and, after stimuli. This set of data is then compared to a baseline that is established for each individual person. By performing this comparison, GlucoSight can determine if the individual is currently within their ideal blood sugar range or outside of it. The process for measuring the eye takes roughly 10 seconds. An individual with a GlucoSight looks into the light-isolation monocle and activates the phone-based application. The results appear in nearly no time. No pain, no blood.